Built From Scratch: The Fingerbangerz DJ crew gets ready to shred. From left to right: G-Wrex, Cutso, Golden Chyld, Ngobility, Replay and Square One. THE FINGERBANGERZ DJ crew suggest meeting at Taco Bravo for an interview. For those unawares, Taco Bravo is a infamous Campbell refueling station for many local up-and-coming bands. Over the years, the quasi-Mexican food stand has nourished thousands of bands, roadies and fans who line up for cheap eats before and after a gig. The Fingerbangerz are not a traditional band per se, but their new album, VI.R.US, finds the six San Jose-based turntablists rightfully elbowing a space at the counter next to the ponytailed boys carrying gear bags. DJs Square One, Golden Chyld, Cutso, Ngobility, G-Wrex and Replay have spent two years crafting their debut album, which finally comes out the first week in December. Local writer and DJ Billy Jam runs Hip-Hop Slam--a label and website dedicated to scratch music that releases the popular Scratch Attack compilation CDs. He is considered one of the foremost experts on the genre and one of the first people to help explode turntablism worldwide. He has watched the Fingerbangerz evolve from scrappy DJs to finessed producers. "The only reason why San Jose doesn't recognize the Fingerbangerz like some big hometown rock band is same reason the world at large doesn't recognize brilliance of any turntablists--namely that their brilliance does not translate into record sales or sell-out shows," he says. "But yet they are pushing the new music envelope much more than a million retro garage bands combined. "I sincerely think that they are the most talented Bay Area crew out there right now," he adds. The crew's age hovers between 21 and 24. They came together at Cutso's 17th birthday party. Most have been DJing since they attended Silver Creek High School. Instead of going out, studying or getting real jobs, they focused on the future and their skills, and stayed home to practice. They've dedicated their lives to looking for--and tweaking--that elusive perfect beat. "Let's just say [that] instead of having the car of my dreams, I have a real studio," says Ngobility, to much assertion. The members are highly visible in the club battle circuit. They spin in jiggy nightspots and underground art galleries. They perform mind-blowing individual and team scratch routines. 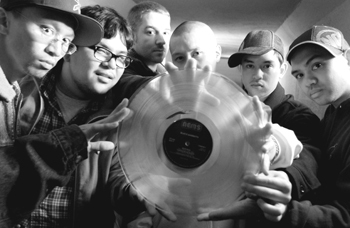 In 1999, a couple months after forming, the Fingerbangerz debuted a sickening 12-turntable routine at a Zebra Records battle. It blew away the crowd, which included turntable legends the X-Men (now the X-ecutioners) and scratch godhead Q-Bert. "It was a landmark moment. It solidified us as a crew," Golden Chyld says. The audacity of taking a ludicrous amount of turntables into the world's scratch epicenter and making it work is not lost on the guys. It's a mind-set that affected the Fingerbangerz from the first drop of the needle: perfect the art of taking chances. "We had nothing to lose," said Ngobility. "Nobody knew who we were. If we fell on our face, so what? It was that drive that made us good, so we tried everything. We didn't hold back." The same experimental vibe seeps into the new 15-track, full-length record, VI.R.US. The album was composed of vinyl, samplers, keyboard and Brazilian guitar. Songs like "Unheard Of" and "Listen" take listeners on a tumble down the Fingerbangerz audio wormhole, disconnected voices from various sources reaching out to form an abstract dialogue, chopped beats and effects panning from speaker to speaker, sometimes breaking up and disappearing and reappearing in mutated form. "Lesson Unlearned" is a dramatic antiwar track, marching through the mental battlefield, tripping across sparking barbed wire. Many have a cinematic feel, conveying darkness, strength and endless drama. Fans of Prefuse 73, DJ Krush, Triple Threat, Björk and 50 Cent will find something to like on VI.R.US where abstract beat making nestles up to West Coast scratch madness. The album is the result of an intense collaborative effort spread among the six DJs and four studios. One DJ came up a basic sound, burned it and passed the disc to one another until each added their own insight and flavor. "Deep down, when we passed the data off, I would hear what he did, and I would say, 'Damn! I could do better than that!'" says Square One to laughter. "We all have that DJ battle mentality inside our heads. Everyone is trying to outdo each other, and that's cool. It makes it what it is." "Straight B-boys" says Golden Chyld. "Everyone put these little seeds, and this nice little tree came out," Ngobility adds. "I look at it as crossbreeding a dog with other crossbred dogs," concludes Cutso. More than anything, the Fingerbangerz want to be viewed as more than club or battle DJs. The group set up a business plan, and VI.R.US is step one on the spreadsheet. Step two is having each member release solo and collaborative CDs in the next year. If all goes as planned, and VI.R.US spreads, the Fingerbangerz will be one of the top production and remix crews in 2004. "This is the only to way to show the rest of the world," Ngobility concludes. "We open our heart and soul." From the October 30-November 5, 2003 issue of Metro, Silicon Valley's Weekly Newspaper.